What does your 100m time tell you about your ability to run a mile? What does your 800 meter time tell you about your ability to run 5 miles? A little more, but basically, not much. What does your 5k time tell you about your ability to run a trail 50k? On the other hand, as I opined way back in February, if you train in a balanced way you can be ready for both. At least that's the hope as I put last week's effort behind me and turn towards the task that lies before me on Saturday: the Stumpjump 50k. The Stumpjump is a pretty special race for me. First, it's held on trails that I used to run and mountain bike as a kid. My old stomping grounds. I remember my first 20 mile run was in Prentice Cooper. My long time training partner Andy Anderson and I stashed a couple of quarts of gatorade back on the old four wheel drive roads. We were just done with high school--I think it was the summer before college--and Andy was trying to convince me to run a marathon. I told him that if I could run 20 miles at 7:00 pace, I'd do it. Andy and I never gave the terrain of our runs too much thought. For us, the roads or the trails, the ups and downs or the flats, hell it was all just running. So, we headed out on this rugged run and I remember early on thinking-for the first time as a cocky high school stud--damn, 7:00 pace is fast. We rolled together for a while, stumbled across the gatorade we'd hidden, talked some, but mostly just ran. I have a memory, an old one, of running the last few miles on what felt like concrete legs. I think I made the run in under 2:20. But it was unpleasant enough to make me realize I didn't want any part of a marathon. Andy, the fool, went on and ran it--breaking 3 hours that fall, I believe, on that one long run and thirty miles a week. 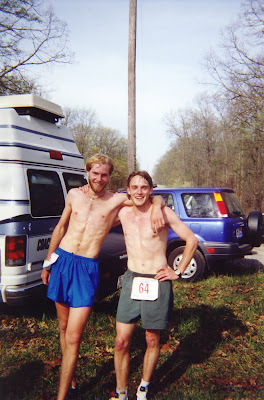 Andy and I ran together again there a couple years later in a 10 mile trail race, just when trail racing was beginning to be popular. We were both fit as hell, coming off of college training. Andy was struggling a bit with some IT problems. We wore XC spikes in the race, and the two of us dropped the field like it was nothing and just cruised through. Andy had to stop a few times and stretch his IT band every now and then, so we'd just take a quick break, then get back to hammering. We ran it like all the other runs we did together--cruising, feeding off each other, sharing whatever pain that was there. The next time I ran these trails was in the 50k in 2005. This race marks the beginning of my second running career. I had been teaching and coaching at the time and running very little. I was in my late twenties, still close enough to college training to remember how to run fast, but not close enough to actually do it. I went to the front of course and ran with a couple of trail veterans, Jamie Dial and Dewayne Satterfield. I didn't know anything. Didn't carry water or fuel. Wore a big old cotton shirt. And was wondering why these guys were walking the damn hills. At 16 miles, I took off, thinking, I'm done walking with these old dudes. Dewayne covered my move and then some, putting the hammer down. My vision got blurry, and I started to go places in my mind I'd never been. Jamie came flying by a few minutes later, yelling out, "On your left!" I ran as hard as I could, chasing him, but I was so disoriented I ended up off the trail and halfway down the mountain. All I knew was to go downhill, that there would be a road down there. Some relief for my misery. I found it, but had to walk/jog about a mile back up the road to the aid station. I gamely got back on the trail and made it about 100 meters or so, but my legs seized up, hamstrings, then quads. I walked--if that's what you can call it--defeated, back to the aid station. I had been intent on dropping out there, but 20 minutes in a chair, about 6 powerades and 5 bananas later, I decided hell it's be quicker to run out of here than wait for a ride. That last 6 miles was hell. But I learned some things about myself. And I swore I'd be back to get the damn thing right. The next year, I had a good run, but not a great run. Andy, his brother John, and I ran together. It was fun, but none of us were in great shape. But I proved to myself that I could cover the distance feeling good. In 2007, I was back and--I thought--ready to roll. But my training hadn't been going well, and the heat plus the frustration of getting off course and running a couple extra miles, and the tired legs I was running on just got to me. I DNF'd at 11 miles. So, here I am a week away, headed back once again. This time, I know I'm fit. Andy's gonna be there too. And a few others. Maybe this time I'll be able to say afterwards: I got the damn thing right. Hey Hoser - Stay on trail this time! Stay patient, the race really will start @ 10 miles to go ... get to 21 fast, but in good shape and then hammerfest! "What does your 5k time tell you about your ability to run a trail 50k?" Well, King of Beasts just this very morning addressed that question: "Jeff is going to try and prove that fit is fit". A 5k and a 50k stompdown in one week. Good luck! Looking forward to hearing how it goes! I have it in the back of my mind for next year but we'll see.